$200,000 - A woman working as a machine operator at a manufacturing plant suffered an injury to her right hand when she fell into a machine at work. $192,000 - Our team helped an injured nurse obtain a significant settlement from a large hospital. $175,000 - We represented a carpenter who sustained a serious back injury while working for his employer that made him unable to continue working as a carpenter. Fields Law Firm focuses on one thing: helping injured and disabled workers throughout Minnesota. We are one of the largest and most respected Workers Compensation law firms in Minnesota. 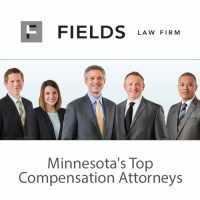 Founded by Attorney Steve Fields, Fields Law Firm has grown to be one of the largest and most respected work injury law firms in Minnesota. We have earned a reputation for helping people who are hurt at work through every stage of the legal process. At Fields Law, we pride ourselves on the level of support we give our clients. We take the time to listen to your story and monitor your case to ensure we understand the full extent of your needs and protect your rights to benefits. To us, you’re not just a file number – you’re a fellow Minnesotan who needs legal help. We work on a contingency fee basis, which means you won’t owe us any fees unless we get money for you. Call us at 1-888-343-5375 any time of day or night, any day of the week, and be connected with a compassionate professional who will gather information about your situation and answer your questions for free.